The Ilianthos Village is built on a golden sandy beach at Aghia Marina, just 8 km. from Chania and 20 km. from the airport. Its location makes it an ideal base for exploring the stunning natural beauty of western Crete and enables excursions to the island's biggest attractions, such as the intriguing archaeological site of Knossos and the spectacular Samaria Gorge. 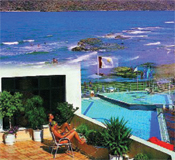 The Ilianthos has 41 beautifully furnished suites, studios and maisonettes for two to eight guests. All suites are air-conditioned with fully-fitted marble bathroom, kitchenette, furnished balcony, satellite TV, direct-dial telephone, safe-deposit box, music and mini-bar service on request. The elegant restaurant serves buffet breakfasts and dinners plus a choice of menus a la carte. In addition, there is a bar in the main lobby, a lounge bar and a snack bar. Other amenities include room service (08.00 - 24.00), babysitting on request, laundry and dry-cleaning, currency exchange and car rental. The hotel also organises excursions to nearby archaeological sites, tours and one-day cruises. Ramps have been installed in all areas to facilitate the movement of persons with special needs. Swimming pool with special section for children, Jacuzzi, sauna, massage, fitness room. Guests can relax on the private beach with umbrellas and sunbeds or choose from a wide range of water sports. Among other facilities, there is a games room, table tennis, billiards, darts and electronic games. The Ilianthos Village has a well equipped conference hall with a capacity for up to 60 participants, plus separate office facilities with Internet and e-mail service as well as access to office equipment (fax machines etc. ).